For over 20 years I have personally helped tens of thousands families gently find sleep. I have sold over 100,000 copies of my books, including Good Night, Sleep Tight which families have dubbed “The Sleep Bible”. My sleep method, The Sleep Lady Shuffle is gentle, accessible, and can be catered to your family and your child. Good sleep habits and gentle sleep coaching build a positive parent-child attachment and encourage a strong bond. My sleep method does not involve crying-it-out, and it’s gentle and effective. Over 100,000 families have used my books to learn my gentle and effective sleep coaching method. For the fastest solution available, get instant access to the perfect Gentle Sleep Course for your family. Need support? Find a Certified Gentle Sleep Coach near you to help you work 1:1 through sleep coaching your child. Get my FREE report to find out why crying it out is not your only sleep training option and how my gentle and accessible method will help your child. Let me share my years of experience with you, and help you get started creating better sleep habits tonight! Privacy: I promise to never sell, rent, trade, or share your e-mail with any other organization. 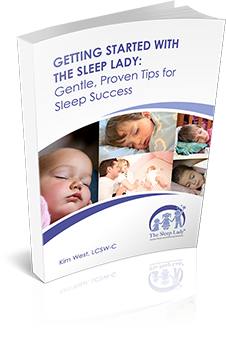 DOWNLOAD MY FREE GUIDE: Getting Started with the Sleep Lady and gently teach your child to sleep without crying it out. Sign up and get my free guide, along with regular articles and vlogs to help you and your child get more sleep!